The Battle of Bloody Run was fought during Pontiac's Rebellion on July 31, 1763. 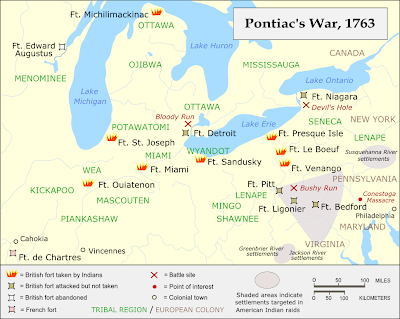 In an attempt to break Pontiac's siege of Fort Detroit, about 250 British troops along with Roger's Rangers attempted to make a surprise attack on Pontiac's encampment. Pontiac was ready and waiting, possibly alerted by French settlers, and defeated the British at Parent's Creek two miles (3 km) north of the fort. However, he did not accomplish the destruction of this British force which would have greatly demoralized the British and dissuaded more British efforts to break the Indian siege of Fort Detroit. The creek, or run, was said to have run red with the blood of the 20 dead and 34 wounded British soldiers and was henceforth known as Bloody Run. The British column approaching the bridge over Parent's Creek. The British advance guard ambushed on the bridge. The rest of the British column preparing to fight back. Pontiac approaching the British column from the rear. Roger's Rangers joining the fray. The indians pay a heavy price for a failed assault on the ruined structure. The majority of the British troops pulled back to defendable cover and started inflicting heavy casualties on the indians. The indians started losing interest in dying and we called it a night. A fairly good semblence of the actual historical event. We used the French and Indian War rules for Brother against Brother. I have come to enjoy these rules for their simplicity. An entire game with a lot of action can be played out in a matter of 2 hours. Another enjoyable week night game and another round of thanks to the host.